This website was developed specifically to tell the story of the Pend Oreille Basin’s natural and cultural history and to help guide those interested in visiting the area. History Hunters is a fun and exciting way to learn more about the cultural landscape around you. While exploring the Pend Oreille Basin with Next Exit History you can check in via the app at the sites you visit, answer trivia questions, and play a scavenger hunt. For completing these activities you will earn points for special Pend Oreille Basin Badges and towards becoming the greatest History Hunter around. 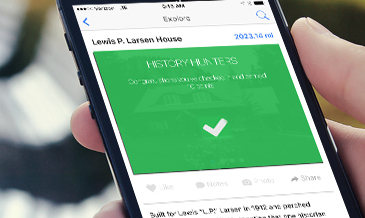 Once you sign up for the game you can play anywhere in the country while using Next Exit History, post your accomplishments to Facebook and see how you stack up against other History Hunters around the world. Happy hunting!